Each year the Bicycle Tour of Colorado hosts the ultimate cycling experience through the beautiful Rocky Mountain countryside. The website includes details of the annual journey—such as the itinerary, route and lodging—updated as they take shape. Infographics illustrate the route, landmarks, mileage and elevation gain during the seven-day event. 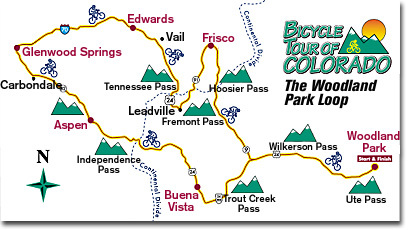 Mountain icons, displayed above, indicate specific landmarks and mountain passes in the cycling route of the Bicycle Tour of Colorado. Elevation gains are shown in the infographic diagram below.